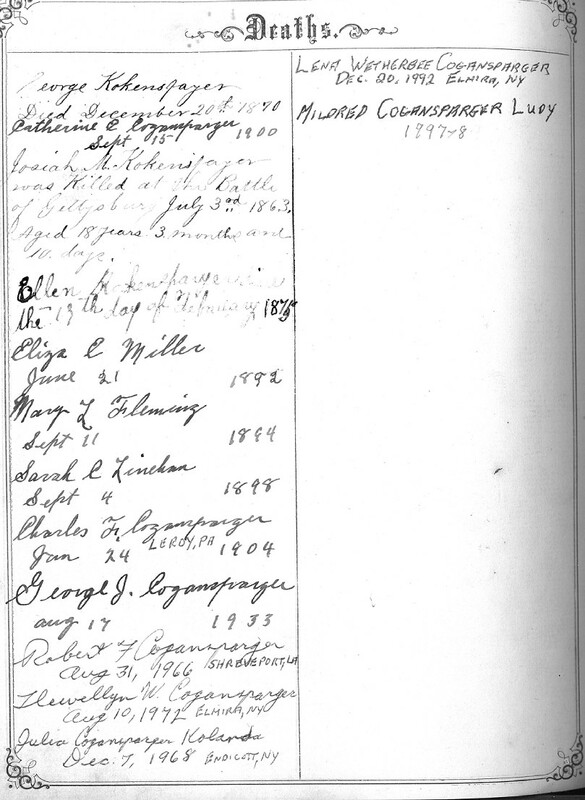 Editor's Note: In March 2005, Daniel Guggisberg, a native of Switzerland and then current resident of California, contributed the following materials from the Cogansparger Family Bible to the Sullivan County Genealogical Web Page. We are most grateful for this contribution. Daniel is a descendant of this family, whose surname is spelled in a variety of ways: Kochersperger, Cogansparger, Guggisberg, Kohensparger, Kohersperger, and so forth. You can learn more about the family at The Kohensparger Clan. Daniel obtained scanned copies of the bible from Russell Earl Cogansparger of Elmira, NY, Russell is the son of Llewellyn Walter and Lena O. (Wetherbee) Congansparger, the grandson of Charles Frank and Alice Estella (Crofutt) Cogansparger, the great-grandson of Georg and Catharine E. (Cranmer) Kochersperger [note the surname change], and the great-great-grandson of the emigrant couple Georg Jakob Kochersperger IV and Catherine (Eyer) Kochersperger. 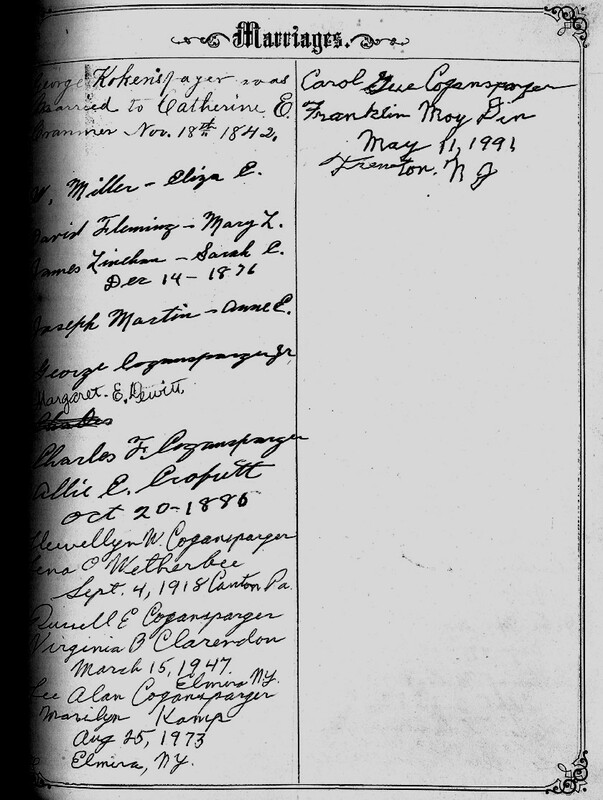 We have reproduced five separate scans here: Birth Records, Marriage Records, Death Records, Testimonial to Josiah Kocerhsperger, and a General Military Registry for the 93rd Regiment of the PA Volunteers. The last two items can be accessed only by clicking on the links, due to the file size. Comments are provided where appropriate. Russell Cogansparger of Elmira, NY has made good on his promise to scan me the pages of his old Cogansparger (Kokensparger) family bible which dates back to about 1842, when George Kokensparger (born as Kochersperger) married Catherine E. Cranmer. Remember, George Kokensparger was the elder son of George Jakob of Sullivan County and must have moved early on to Bradford County, PA.
As an extra bonus he also included some type of Civil War memorial document pertaining to Josiah M. Kokensparger who died at the battle of Gettysburg on July 3rd, 1863. 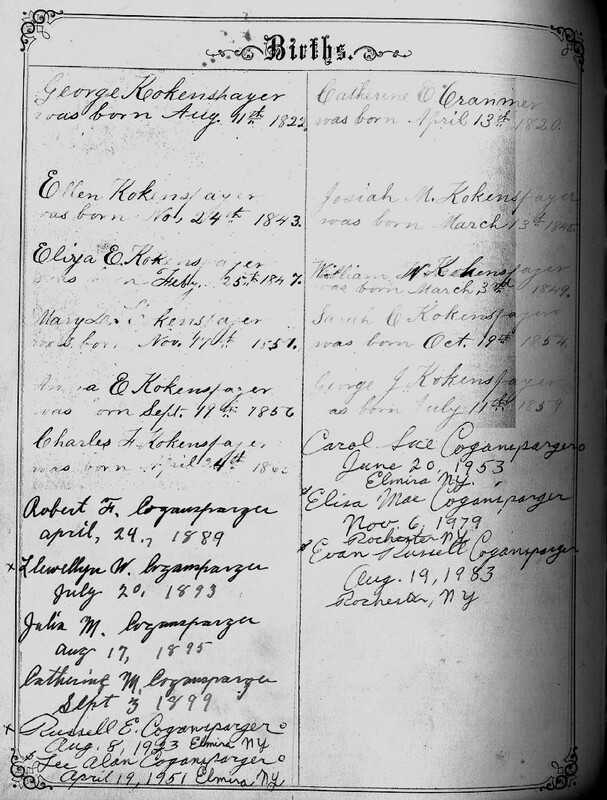 Because Josiah's military record spelled the name "Cogansparger" the surviving mother, in order to qualify for a pension, decided to change the surname of the family in order to match the record. At least, that's the family lore. The other Civil War document shown here is some regimental roster that lists Josiah's brother William. No one knows what happened to him; his death is not recorded in the bible. **Editor's Note: Notice that Catherine changed her married name from Kokensparger at the time of marriage to Cogansparger at some point thereafter. 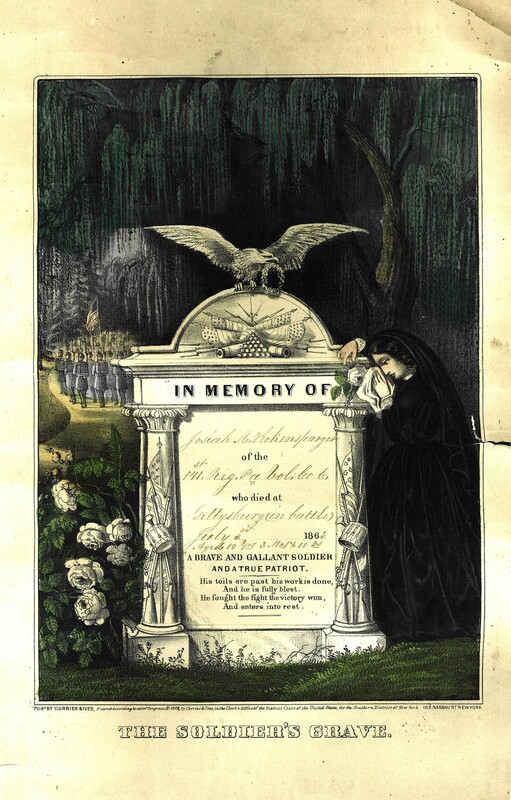 The story goes that she did so in order to qualify for the pension earned by her son Josiah's service and death in the Civil War. 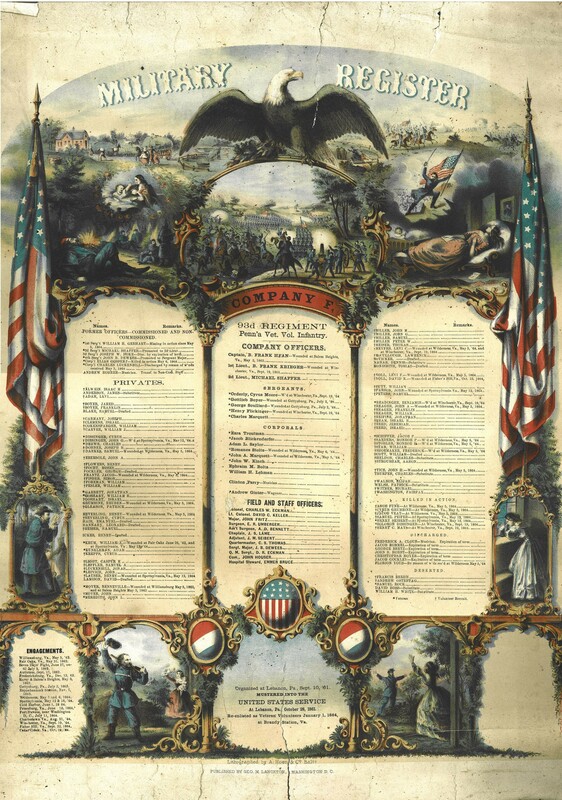 Note the listing of William Kohensparger in the left column. Please direct any comments to Daniel Guggisberg and to Bob Sweeney, PhD, Sullivan County Historian.